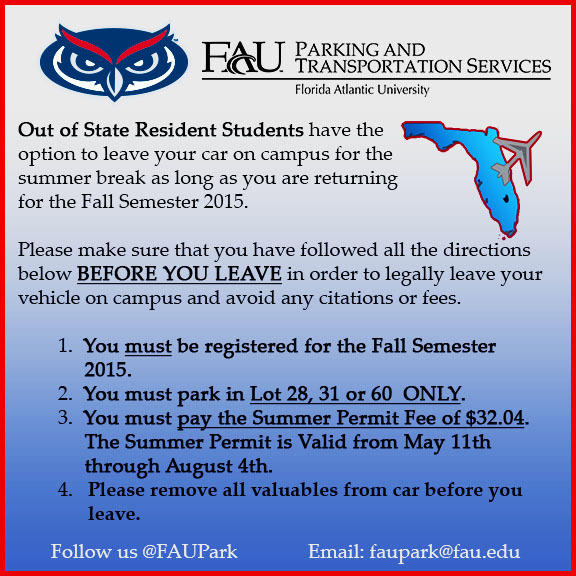 Out of State Resident Students have the option to leave your car on campus for the summer break as long as you are returning for the Fall Semester. Please make sure that you have followed all the directions below BEFORE YOU LEAVE in order to legally leave your vehicle on campus and avoid any citations or fees. You must be registered for the Fall Semester 2015. You must park in Lot 28, 31 or 60 ONLY. You must pay the Summer Permit Fee of $32.04. Summer Permit is Valid from May 11th through August 4th. Please remember to remove all valuables from the vehicle.